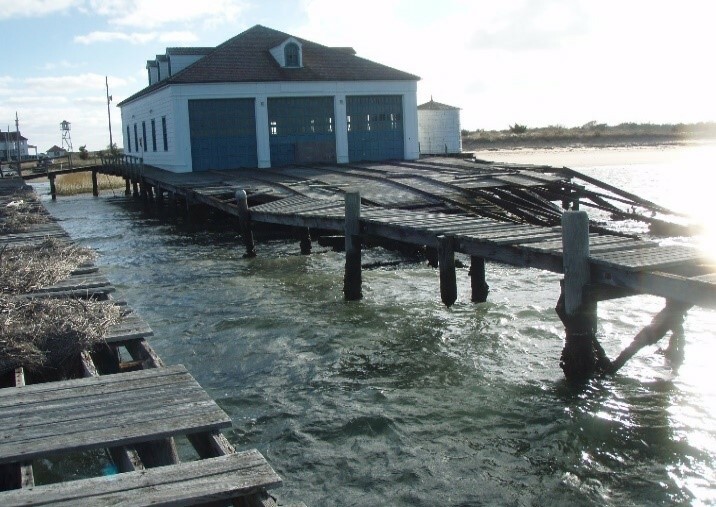 Childs Engineering Corporation, as a consultant to the prime architect, designed the repair and reconstruction of a variety of marine elements associated with the United States Coast Guard Boathouse complex (formerly a Lifesaving Station) at Toms Cove Hook located in the Assateague Island National Seashore, Virginia. The scope of work included reconstruction and repairs to the facility piers and pile foundations. The design entailed rebuilding to historic criteria and appearance. Childs, in cooperation with the Park Service, utilized modern technology to strengthen various components of the pier, without significantly altering the historic appearance of the structures. One of the challenges for consideration of construction was the lack of site accessibility. The site is accessible by water, however there are no roadways via land and only sandy beaches with restricted access due to wildlife concerns. During the preliminary work, considerations were also made to move the facility to a more accessible location and/or to raise the pier and building structure above FEMA Flood Zone elevation. Childs Engineering Corporation was tasked with providing design documents for bidding, requiring both a topside and underwater inspection, evaluation, and design of repairs of the Boathouse supporting pier structure, Life-Boat Launchway, and portion of the T-Pier. Childs designed structural repairs to re-establish support to the existing timber pile foundation pier used to support the Boathouse. The proposed repairs consisted of the installation of new timber pile posts and concrete splice jackets on the deteriorated piles and the repair or replacement of timber pile caps, stringers, decking, and handrails.